Anne-Louis Girodet de Roucy-Trioson (1767-1824), The Meeting of Orestes and Hermione (c 1800), pen and brown and black ink, point of brush and brown and gray wash, with black chalk and graphite, heightened with white gouache on cream wove paper, 28.5 x 21.8 cm, Cleveland Museum of Art (Leonard C. Hanna, Jr. Fund), Cleveland, OH. Courtesy of Cleveland Museum of Art. Helen, daughter of Zeus and Leda, who was the wife of King Tyndareus of Sparta, married Menelaus, successor to Tyndareus. Paris (Alexander) wanted Helen, so eloped with, or abducted, her back to Troy, where they lived together. Menelaus went to fight the Trojans, leaving his daughter Hermione in the care of Tyndareus, who agreed her marriage to Orestes, son of Agamemnon. Menelaus agreed that Hermione should marry Pyrrhus (Neoptolemos), so took Hermione from Orestes and gave her to Pyrrhus. However, Pyrrhus had taken Andromache, widow of Hector, as a concubine. Hermione plotted Andromache’s murder, but Orestes and Hermione then eloped. Orestes plotted the murder of Pyrrhus, but he was killed at Delphi. Orestes later married Erigone, the daughter of his mother, Clytemnestra, by her lover Aegisthus after they had murdered Orestes’ father, Agamemnon. Orestes murdered his mother and her lover, and later Alete, Erigone’s brother. Perhaps I had better explain a little more slowly. Helen, ‘the face that launched a thousand ships’, was conceived by Leda, who was the wife of the King of Sparta, Tyndareus, when Jupiter seduced her in the form of a swan. When she grew up, Helen married Menelaus, who succeeded her father as the King of Sparta, and the couple had a daughter named Hermione. Following the Judgment of Paris, Paris made off with Helen from Sparta, and took her back to Troy: an action which precipitated the war between Greece and its allies, and Troy. Paris was also known as Alexander. With Helen already in Troy, Hermione’s father Menelaus left Sparta for the war against Troy, leaving their daughter in the care of Helen’s father, Tyndareus. He agreed for Hermione to marry Orestes, who was her cousin, being the son of Agamemnon, Menelaus’ brother. It seems likely that by the end of the Trojan War, Hermione and Orestes were living together as a couple. While Menelaus was away fighting against Troy, he agreed that his daughter Hermione should marry Pyrrhus, who was also known as Neoptolemos, and was the son of the great Greek warrior Achilles (who was killed by Paris towards the end of the war). When Menelaus and Pyrrhus returned from the war, Menelaus implemented that marriage by taking Hermione away from Orestes, and giving her to Pyrrhus. However, Pyrrhus had not returned alone from Troy; he had brought with him a concubine, Andromache, who had been the wife of Hector and mother of Astyanax. Achilles had killed Hector in the war, and Pyrrhus had (probably) thrown young Astyanax to his death from the walls of Troy during its sacking. The arrival of Andromache and the enforced marriage to Pyrrhus were understandably very distressing to Hermione, who quickly developed a dislike of Andromache, which was mutual. Hermione accused Andromache of using sorcery to prevent her from conceiving a child by Pyrrhus, which might have strengthened her position, in return for which Andromache taunted Hermione for remaining childless. As a result, Hermione started to plot the murder of Andromache, her bitter rival. Orestes visited Hermione, and the couple seized the opportunity to elope. Orestes then started to plot the murder of Pyrrhus, which would release Hermione from her enforced marriage. Although some accounts claim that it was Orestes who killed Pyrrhus, others claim that he was killed when he visited the oracle at Delphi, because he desecrated the temple there; either way, Pyrrhus was dead and Hermione was free to marry Orestes. Orestes’ father, Agamemnon, the brother of Menelaus, had commanded the Greek forces during the Trojan War. When he returned to his kingdom of Mycenae, he found that his wife, Clytemnestra, who was Helen’s (half-)sister, had made Aegisthus (who was Agamemnon’s cousin) her lover. Clytemnestra and Aegisthus then plotted the murder of Agamemnon, and although there is disagreement about which of them actually did the deed, the hero Agamemnon was then killed, and Aegisthus and Clytemnestra ruled Mycenae. Back in Sparta, Orestes and Hermione had a son, Tisamenos. Eventually, after Aegisthus and Clytemnestra had had children of their own, Orestes returned to Mycenae, where he murdered Clytemnestra (his mother), Aegisthus, and their daughter (confusingly named Helen), in vengeance for the death of his father. Orestes returned to Sparta, and Hermione disappeared, probably dying. When Aletes, the surviving son of Aegisthus and Clytemnestra, came of age, Orestes returned to Mycenae, killed Aletes (his half-brother), married Erigone, his half-sister, and assumed the throne. For his matricide – an unusual crime even for the murderous mythical Greeks – Orestes was pursued by the Furies, and driven mad. Hermione’s part in all this may seem minor, but she suffered a raw deal when she was forcibly taken from Orestes and given to Pyrrhus, who already had a concubine. Real history has also done her a disservice: Sophocles’ play Hermione has been lost, but Euripides’ play Andromache survived, and has spawned operas and plays, including Racine’s tragedy Andromaque (1667), which has remained quite popular. The one account which is sympathetic to Hermione’s plight is letter 8 of Ovid’s Heroides. This fictional letter in Latin verse is a plea by Hermione to Orestes, written when Hermione is in her enforced marriage to Pyrrhus, while Andromache is his concubine. Of Ovid’s fictional letters, it is one of the few whose pleading is satisfied, and Hermione is thus one of the few such heroines who achieves the happiness she craves. Artist not known, Scene from Euripides’ Tragedy ‘Andromache’ (before 79 CE), fresco, west wall of the winter triclinium in the Casa di Marco Lucrezio Frontone (V 4,a), Pompeii, Italy. Image by WolfgangRieger, via Wikimedia Commons. 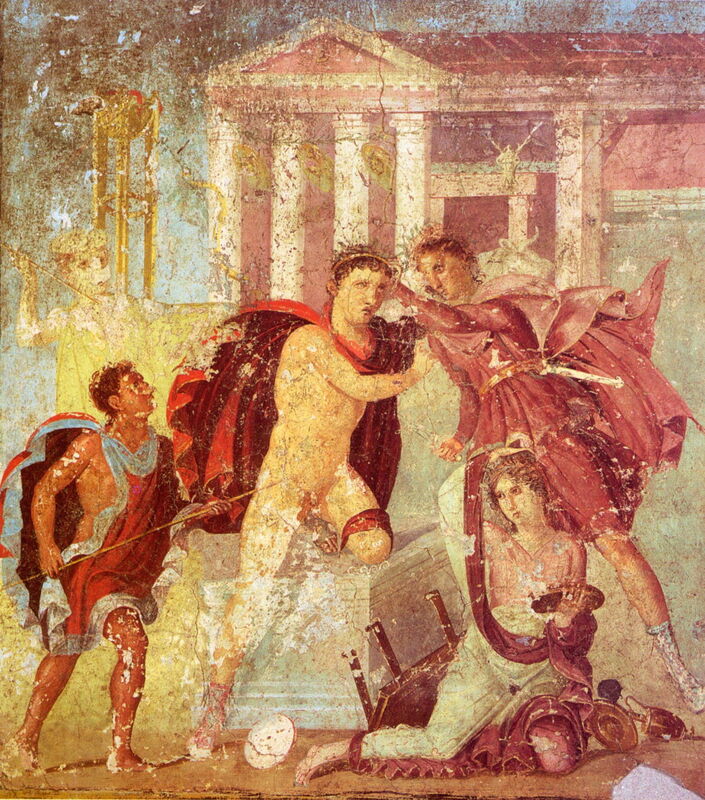 This fresco from Pompeii shows a scene from Euripides’ play Andromache, in which Pyrrhus is about to be murdered by Orestes, with Hermione in attendance. Pyrrhus part-kneels on the altar of Apollo at Delphi, in the centre, as Orestes, on the right, is about to kill him with the sword held in his right hand. There do not appear to have been any further paintings of Hermione until about 1800, when two great French history painters tackled the story. 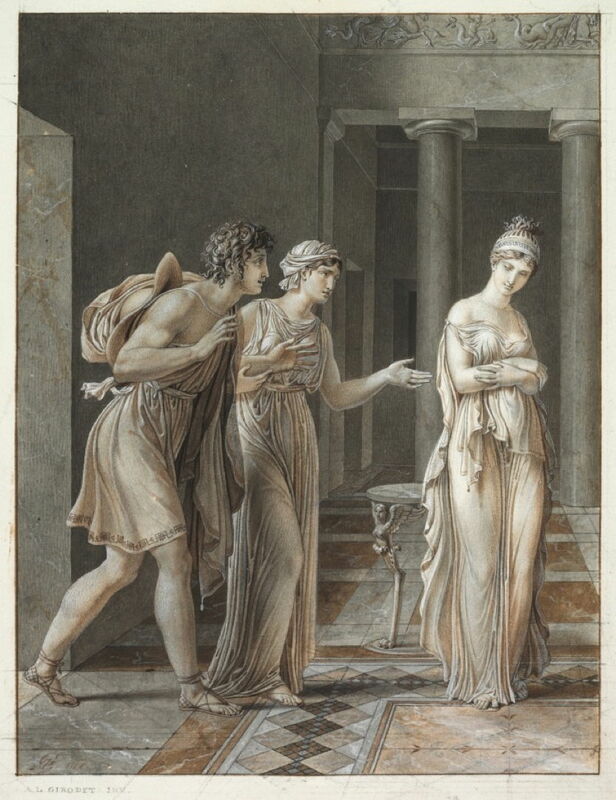 In Girodet’s ink and chalk drawing of The Meeting of Orestes and Hermione (c 1800), Hermione is seen at the right, her arms folded, looking coy as Orestes approaches her. The second woman, with Orestes, is presumably Hermione’s maid. This drawing is one of a series of illustrations made by Girodet to accompany Racine’s play, and has subtleties which you might expect from a great narrative artist. Visible in the gap between the figures is a table-leg in the form not of a Fury (which might have foretold Orestes’ fate), but of a siren, implying that Hermione is luring Orestes to her. Hermione, for all her apparent coyness, has let the right shoulder-strap of her robe slip, in her enticement of Orestes. She has assumed the role of femme fatale, as portrayed by Euripides and Racine. 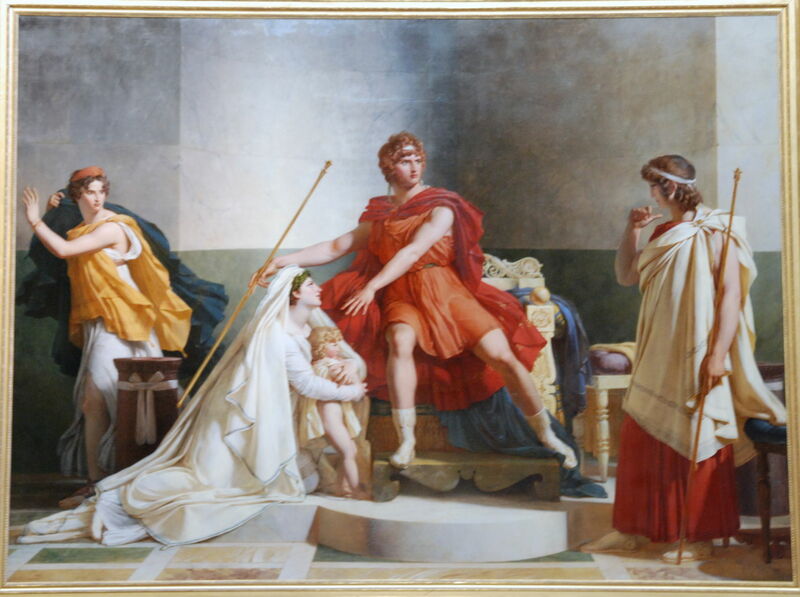 Pierre-Narcisse Guérin (1774–1833), Andromache and Pyrrhus (1810), oil on canvas, 342 × 457 cm, Musée du Louvre, Paris. Image by Janmad, via Wikimedia Commons. Just a decade later, Pierre-Narcisse Guérin made two paintings exploring this story. In Andromache and Pyrrhus (1810), the central figures of Pyrrhus, seated on the throne, and Andromache, kneeling at his side and clutching her young son, are in conflict with two other women. It is most likely that the figure at the right is Hermione, who is being displaced from her enforced role as Pyrrhus’ wife by Andromache. The child is almost certainly Astyanax. Although some accounts tell that Pyrrhus threw the boy to his death from the walls of Troy, others, including Euripides, claim that Astyanax survived the sack of Troy, and accompanied his mother when she was taken as Pyrrhus’ concubine. When Hermione plotted the murder of Andromache, she included the killing of Astyanax. Pierre-Narcisse Guérin (1774–1833) Orestes Announces the Death of Pyrrhus to Hermione (c 1810), oil, dimensions not known, Musée des Beaux-Arts de Caen, Caen, France. Wikimedia Commons. 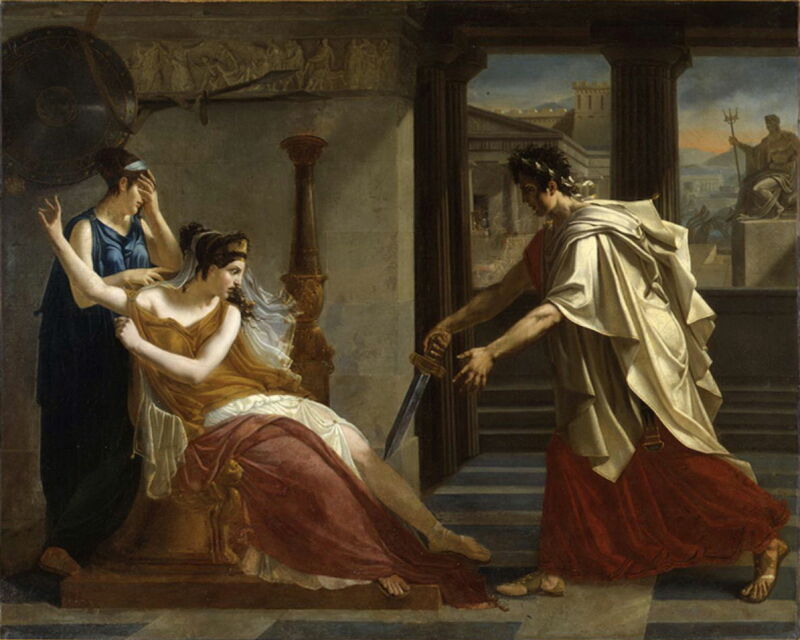 Guérin’s Orestes Announces the Death of Pyrrhus to Hermione (c 1810) shows a scene described later in Euripides’ and Racine’s plays, in which Orestes has just murdered Pyrrhus at Delphi, and here tells Hermione of that death, by flourishing the sword which he used. Hermione is shocked, as is her maid standing behind her. Guérin painted at least three other stories which are the basis of letters in Heroides: Phaedra and Hippolytus (1802), Dido and Aeneas (c 1815), and Sappho (date not known). In this case he chose not to follow Ovid’s heroine, but Euripides. What’s the link with Harry Potter? Hermione has appeared as a character in a long succession of plays and operas, among them William Shakespeare’s The Winter’s Tale, where she is the virtuous and beautiful Queen of Sicily. The latter was the inspiration for the name of the character Hermione Granger in JK Rowling’s Harry Potter novels. Played by Emma Watson in the movies made from those books, Hermione has returned to fame. It seems to have taken more than three millenia, and a modern novellist, to have got a fairer deal for poor Hermione. Posted in General, Language, Life, Painting and tagged Girodet, Guérin, Harry Potter, Hermione, Heroides, Ovid, painting, Rowling, Shakespeare, Troy. Bookmark the permalink.